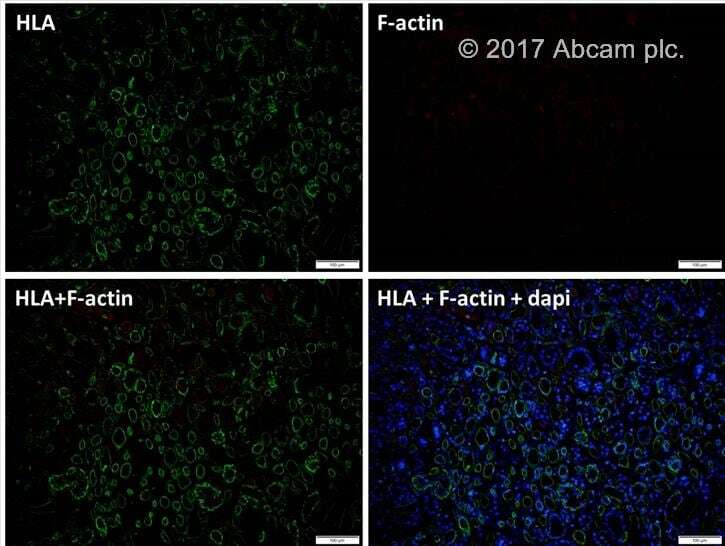 F-actin Staining Kit - Red Fluorescence | Cytopainter (ab112127) fluorescence imaging kits are a set of fluorescence imaging tools for labeling sub-cellular organelles such as lysosomes, mitochondria, and actin filaments. The selective staining of cell compartments provides a powerful method for studying cellular events in a spatial and temporal context. ab112127 is designed to stain F-actins in fixed cells with red fluorescence. The red fluorescent phalloidin conjugate, which is selectively bound to F-actins, is a high-affinity probe for F-actins. The red fluorescent phalloidin conjugate has Ex/Em = 594/610 nm. Used at nanomolar concentrations, phallotoxins can be conveniently used to label, identify and quantitate F-actins in formaldehyde-fixed and permeabilized tissue sections, cell cultures or cell-free experiments. The red fluorescent phalloidin conjugate has good thermal and photo stability. ab112127 provides all the essential components with an optimized labeling protocol. It is an excellent tool for preserving fluorescent images of particular cells, and can also be used for fluorescence microscope demonstrations. ab112127 should be stored dessicated. 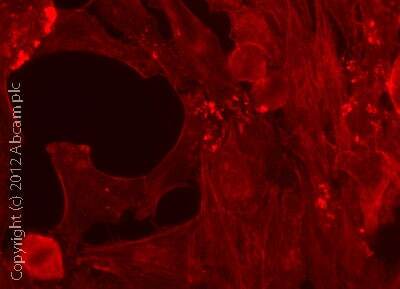 F-actin staining (red) in chondrocytes in growth plate cartilage. Mouse femur bone was fixed with 4% PFA for 72 hours, decalcified and cut into 8-10 µm sections in frozen. Tissue was then stained for 60 minutes with ab112127 before a final wash in PBS. HeLa cells were fixed with 4% PFA for 10 minutes, rinsed with PBS and stained for 60 minutes with ab112127 before a final wash in PBS prior to mounting slides. Images obtained with an Olympus BX61 microscope using a Texas Red filter (595/613nm) - 50ms exposure. Images of CPA cells fixed with formaldehyde and stained with ab112127 in a black 96-well plate Left image: Cells labeled with 1X Red Fluorescent Phalloidin Conjugate for 30 min only. Right image: Cells treated with phalloidin for 10 min, then stained with Red Fluorescent Phalloidin Conjugate for 30 min. Publishing research using ab112127? Please let us know so that we can cite the reference in this datasheet. I have tried this Kit on paraffin embedded sections of adult human kidney. Because the protocol is for ICC I adjusted it to IHC. In addition, I combined it with HLA staining (ab52922, routinely used at our lab) to visualize the tissue. Deparaffinization and antigen retrieval was done with commercial - ZYTOMED's OmniPrep (pH 9). Slides were washed with PBS-Tween (0.05%) and blocked (commercial - Invitrogen's CAS-Block) – 1h at RT. Anti-HLA was incubated for 1h at RT and washed with PBST three times. Phalloidin reagent was prepared according to protocol in three dilutions: 1/250, 1/500 and 1/1000. Secondary Alexa flour 488 donkey anti rabbit was added to each reagent tube at a 1/1200 dilution. Slides were incubated for 1h at RT and then washed three times with PBST. Secondary only slices (only Secondary Alexa flour 488) were used to determine exposure time threshold. There was no signal above background in all three Phalloidin dilutions. The picture (at the Texas Red Tfilter) was taken in slight overexposure to show the absent of staining. We used cytopainter F-actin staining kit to study morphology in the model organism Hydractinia during head regeneration. We fixed our whole animals in 4% pararfomaldehde in PBS followed by three ten minute washes in 0.1%triton in PBS. The animals were incubated in component in at a 1:500 dilution in component B for 45 minutes. They were then washed in PBS three times and mounted in fluorescent mounting medium. 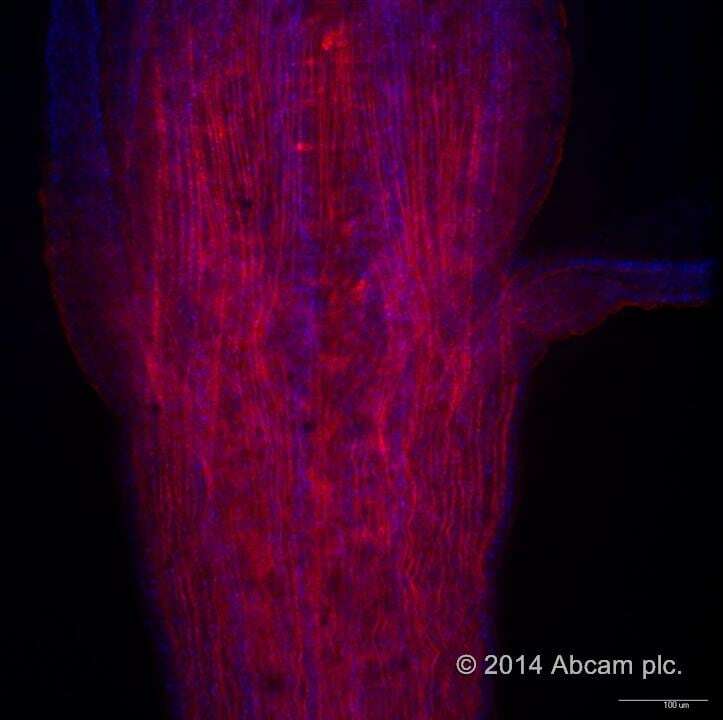 The picture shows F-actin staining(Red) and Hoescht nuclear staining(blue). The image was taken on a spinning disc confocal microscope.